Early November snow makes a November-coloured stained-glass landscape. I am so much in the mood for spring! 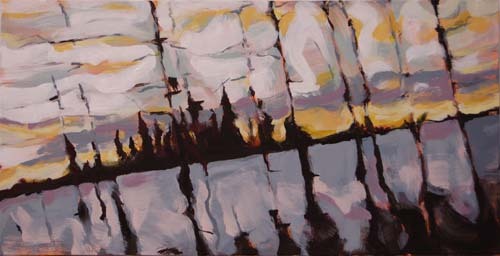 The heavy wet snow leaves an art deco style pattern in purple, gold, brown and gray on the forest of dead pines. Indian paintbrushes are one of my favourite wildflowers. They’re everywhere in northern BC late in the summer. 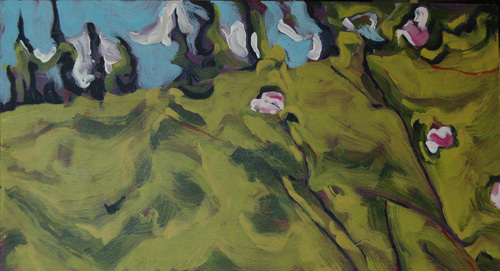 In this painting they dance happily between the dark purple background and the pale green grass. 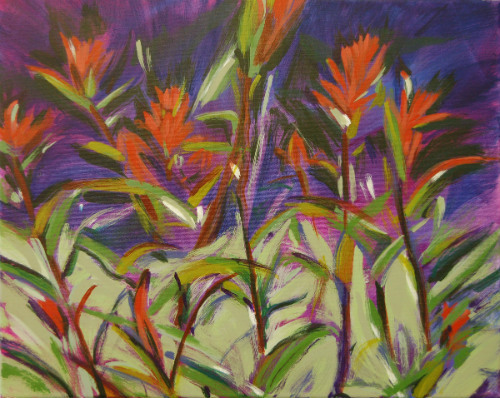 $225 – available at Two Rivers Gallery in Prince George. 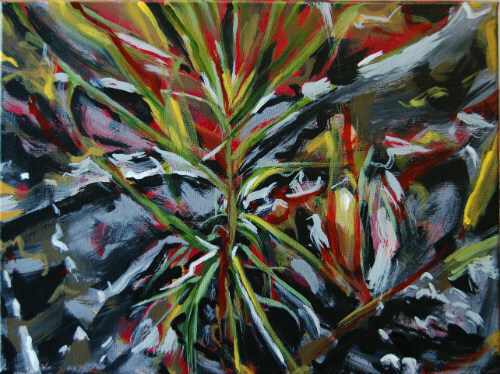 This winter did seem to drag on and I got tired of snowy winter scenes, so I painted some now green life, a brand new pine seedling. It’s also a powerful symbol for the re-growing pine forest that was killed by the mountain pine beetles a few years ago. We often have wonderful sunsets here in the winter. There is not very much daylight these days, the sun is only up at 8:30 and down again at 4. But light is coming and the days will slowly get longer. This is the last painting I made in 2013. 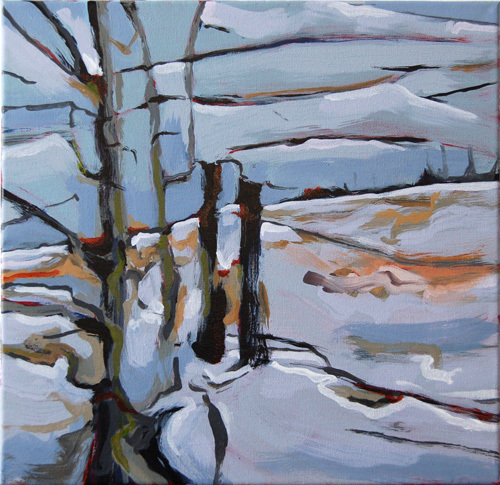 $800 – available at Groop Gallery in Prince George. Although fall is my favourite season, it gets pretty drab after the leaves go, but here and there are these small bits of brilliance. After the snow goes, the land here is coyote colored for a few weeks. 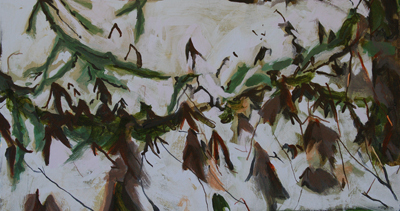 This painting is from walking in the snow and seeing all the Labrador tea around the bottom of the swamp spruce trees. 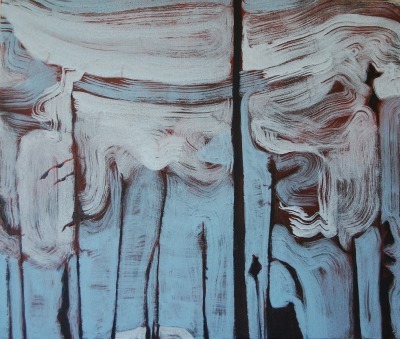 This painting is inspired by the forty below sky January last year. Crazy electric blue. There is a wonderful and endless parade of fascinating pattern in the ditch, especially evident in the winter as weeds and shrubs partially emerge from the snow. I’m still working on this series of Tapestry paintings. I loved the tops of these swamp spruce about six months after a forest fire. They look so good against the bright blue sky. 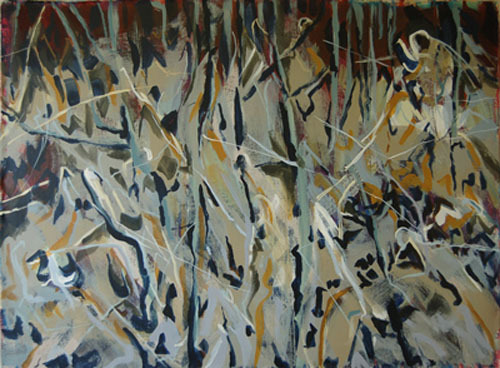 I started with a dark red undercoat and put on the dark trees and then the swirling bands of sky. 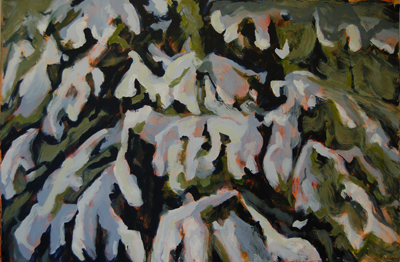 This painting is about the almost abstract patterns made by the heavy snowfall on a group of young pines. You would get so full of snow if you tried to walk between these trees. 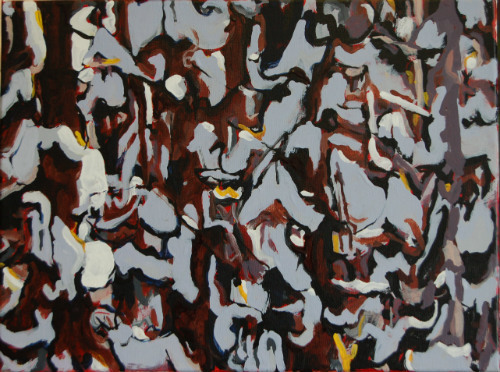 The hard part of this painting was getting the dark areas dark enough. 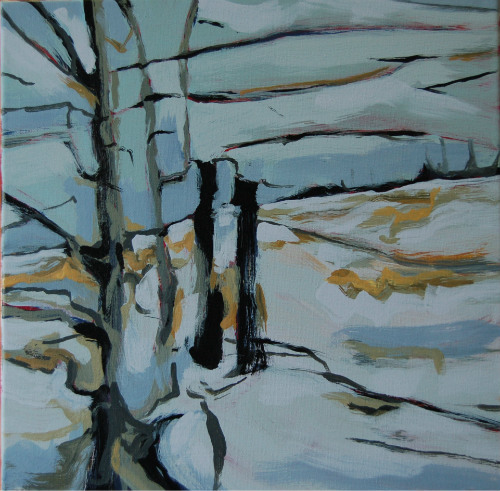 The orange underpainting peeks out here and there, and gives a bit of contrasting glow. And it has a lot of one of my favourite colours, young pine green. 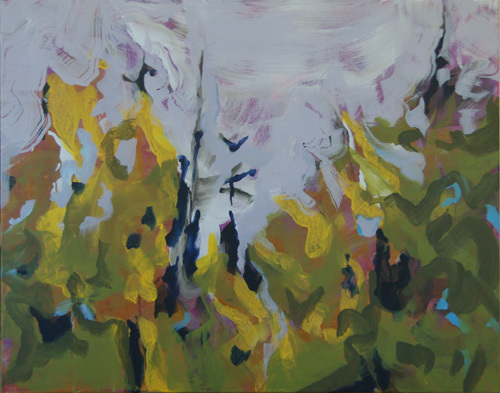 This painting is all about how every year at this time I feel compelled to paint those brilliant yellows. I love the fall, it’s such time of relief after the heat and bustle of the summer. And one of my favourite things in fall is the glorious colour of the poplars and cottonwoods. 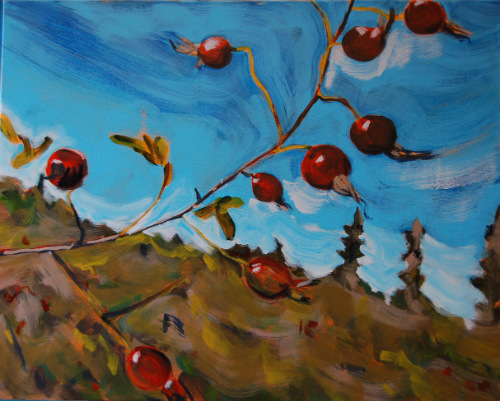 I started this painting at a demonstration as part of Culture Days at Two Rivers Gallery. Wonderful blog, and love that Burnt Swamp Spruce. Gorgeous. Great that you are going to Banff to me that’s really something. Thanks so much for visiting my blog. It seems like a big deal to me too, and I’m pretty excited! I love your colours and the tapestry paintings especially. Thank you so much Kate! Thanks for visiting my blog and for leaving such a kind comment. I like those tapestries, too. that pine seedling is such an image of hope! Thanks for your kind words Chris, new life is so optimistic! My name in Swiss is Annerosli or Anna roselli. Thanks for your very kind comment about my art! I really appreciate it. 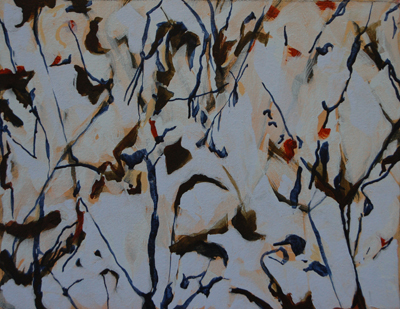 Hi annerose, I really enjoy your lovely art; the abstract quality is a joy to experience! Thanks for the like on my blog, too. Keep up the wonderful work! Thanks so much for your kind words. I enjoy seeing your unique style of drawing. Wonderful. Your color is superb! When I am rich I will be buying. Thanks so much for your kind words, Ron! I’m waiting for rich patrons too, but meanwhile, I’ll just keep painting, as I know you will.